The head of the UN admits to Israeli students that the organization he heads is biased against the Jewish state. The head of the United Nations admitted this past week that the organization he heads has had a bias against Israel. “Unfortunately, because of the Israeli-Palestinian conflict, Israel has been weighed down by criticism and suffered from bias and sometimes even discrimination,” UN Secretary General Ban Ki-moon admitted during his visit to Jerusalem, according to the European Jewish Press (EJP). 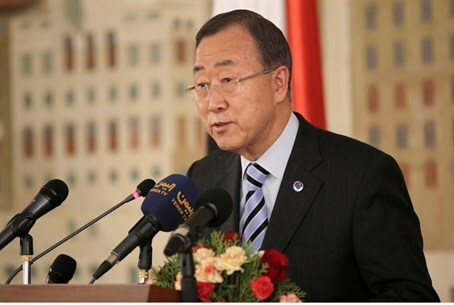 Addressing students participating in the Rishon Lezion College of Management’s Model UN program at the UN headquarters in Jerusalem, Ban said Israel should be treated equal to all the other 192 UN member states. Ban told the students he had come to the region for the sixth time to express his support for the renewed peace talks between Israel and the Palestinian Authority. "I have never been this optimistic," he said, according to EJP, adding that the international community had never had such expectations and hope that the peace process would reach a solution. “This time, I expect real peace,” the UN chief said, urging both sides ‘’to be patient’’ and adding that negotiations are still the best way to reach a two-state solution. “The Israeli and Palestinian people are neighbors and have no choice but to live in harmony and peace, side by side,” Ban was quoted by EJP as having said. On Friday, Ban met with Prime Minister Binyamin Netanyahu, who told him that the Israeli-Arab conflict has nothing to do with the Jewish communities in Judea and Samaria and everything to do with Arab refusal to recognize Israel as a Jewish state. “As far as the Israeli-Palestinian peace process, we have to get to the root cause of the problem and the root cause was and remains the persistent refusal to recognize the Jewish State in any boundary,” said Netanyahu. Ban also called on Israelis and PA Arabs to overcome "deep skepticism" that he said risked thwarting efforts to reach a peace agreement.